California start-up H2 Energy Renaissance today announced it has built a hydrogen generator that's inexpensive to manufacture and produces on-demand affordable hydrogen. The generator uses tap water, aluminum and a small amount of electricity -- from 50 to 150 watts. The electricity can come from a small solar panel, a mini wind turbine, a wall socket or a self-charging battery similar to those used in cars. The aluminum and chemical catalyst can be changed every few days to every few months, depending on the generator's size, the company said. Large amounts of hydrogen are produced by using hydroelectric shock applied to plates of aluminum placed in water. The hydroelectric reaction burns at a temperature hotter than the sun and creates a pressure of more than 100,000 atmospheres at a micro level. 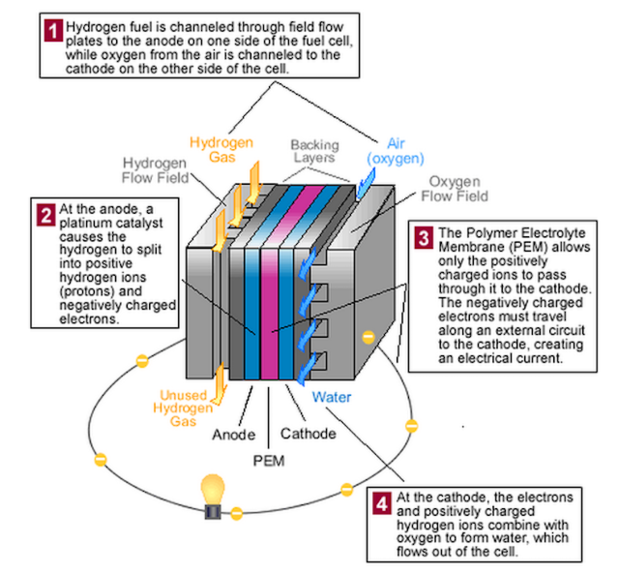 How a fuel cell produces electricity using hydrogen gas. The hydroelectric shock, or electrohydroulic reaction, eats away at the aluminum plates destroying the oxide film on them, which decomposes water molecules releasing the hydrogen. The hydrogen gas is then cooled and has a purity of 97%. The generator runs at 150 degrees Fahrenheit. The byproduct of the generator water and recyclable aluminum leftover. The generators are 15-in wide x 32-in x 20-in long and weigh about 250 pounds. They're able to produce from 10 CFM (cubic feet per minute) and 18 CFM. On per hour basis, the generators can produce 1.4 kilograms to 2.55 kilograms of hydrogen. The generators will be priced at about $2,000 for a home unit and about $5,000 to $15,000 for larger units, according to Kirill Gichunts, CEO of H2 Energy Renaissance. The generators will be much cheaper than solar panels and the payback period would come much shorter, according to the company's marketing material. "The generators use simple materials and are very easy to build: metal sheets, metal plates and some wiring and some electrical components," it stated. "Hydrogen can power virtually anything. Even your entire home will be fully powered by this abundant, clean energy source. Hydrogen also means green travel, whether [in] your personal vehicle or a semi-truck." Honda's FCX Clarity fuel cell vehicle, which the company already leases in California. In 2013, many auto manufacturers announced their first fuel cell electric vehicle (FCEV) plans; Toyota, Hyundai, General Motors, Honda, Mercedes/Daimler have already put FCEVs on the road, others plan to do so over the next couple of years. While FCEV cars are here, however, hydrogen infrastructure remains the greatest challenge to the succesful commercialization of FCEVs, according to the U.S. Department of Energy (DOE). FCEVs, however, have tremendous potential. They are clean, in that they emit only water vapor. And FCEVs such as Toyota's Mirai sedan can travel 300 or more miles on a single hydrogen gas fill-up, which can be done as quickly as tanking up at a gas station. The Toyota Mirai offers the equivalent of 67 miles per gallon of hydrogen gas. By comparison, a full charge in a Tesla Model S sedan provides up to 265 miles of travel. A Toyota RAV4 EV gets only 125 miles on a full charge. Hydrogen gas today is both expensive to produce and in short supply. One kilogram of hydrogen gas costs about $1 per kilogram, but that's only after factoring in government incentives for using hydrogen to produce electricity, according to the National Renewable Energy Laboratory. Without government incentives, the cost for hydrogen gas rockets to $4-$5 per kilogram. By 2020, DOE believes the cost of hydrogen used in FCEVs will be competitive on a cost-per-mile basis with the fuels used in other types of vehicles, such as the gasoline in hybrid-electric vehicles. To address the challenge, the DOE in 2013 joined with automakers and other industry stakeholders to launch H2USA, a partnership to address the key challenges of hydrogen infrastructure. H2USA's mission is to promote the introduction and widespread adoption of fuel cell electric vehicles across America. There are several methods for creating hydrogen fuels. The most common one involves steam-methane reformation, where high-temperature steam (1,000 degrees Celsius) creates a reaction with methane gas in the presence of a catalyst to produce hydrogen, carbon monoxide and a small amount of carbon dioxide. The carbon dioxide and other impurities are removed through a process called "pressure-swing absorption," leaving pure hydrogen. Steam reformation can also be used with ethanol, propane or even gasoline to produce hydrogen. The 2016 Hyundai Tucson Fuel Cell SUV. Steam-methane reformation is most commonly used by oil refineries, which then use the remaining hydrogen to remove impurities such as sulfur from petroleum and diesel fuels. H2 Energy Renaissance's hydrogen generator was first developed in 2009 by an R&D team led by co-founder and president Jack Aganyan. The company said it now can be mass produced and will be able to power not only FCEV cars and trucks but also businesses and homes. If placed in a home to produce electricity, 1kWh (kilowatt hour or 1,000 watts) will cost 5 cents to 7 cents to produce, the company claimed. Today, Californians, for example, pay about 20 cents per kWh; in Europe and Japan 1kWh costs between 20 cents and 30 cents. "The technology is ready to be licensed today," Gichunts said. "We need to market it for mass production. It would take about one year to start mass production from where we are right now."